Marine photographer Walter Cooper was born in Port Huron, Michigan and grew up sailing and boating along Lake Huron. Inspired by his surroundings and his pastimes, Walter's interest in photography began in grade school. Throughout the years of his education, he continued to spend time on the water, both boating and developing his skills and devotion to photography. After receiving his Bachelor's degree from the University of Michigan, Walter continued his education in Lansing, Michigan where he was awarded a technical degree in photography. Shortly after receiving this degree, Walter moved to Miami where he concentrated on marine photography. After a year living and working in Miami, Walter relocated to San Diego for the America's Cup. 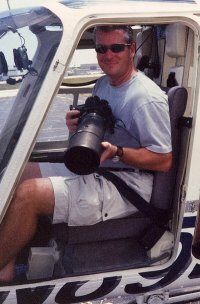 During the 1995 America's Cup Walter worked for America3, the Women's Team as a staff photographer. Following the Cup, Walter returned to South Florida and has since moved to Colorado. He spends his time shooting major yachting events around the country and running his business, Walter Cooper Photography. He is a regular contributor to a number of sailing magazines, websites and has worked for three America's Cup syndicates. Visit his website at waltercooperphoto.com or contact him at 303-526-0853.